Hello, dear Blog-Botherers. I would like wish you all a Very Happy Diwali. I would like, in my usual informative way, to tell you exactly when Diwali is, what it means, and what you should do about it. However it seems asking what Diwali is, is a bit like asking what Christmas is, in that no-one can agree the same date, when it started, or what it stands for. Which is probably why, like Christmas, people just put up some lights, visit the family and get a load of food in. Basically, Diwali is Hindu New Year. I'm glad someone is having a New Year right now because I could do with a bit of New-Yearness. I got made redundant about 15 months ago and decided to try and use that opportunity to get my head over my writing, which had been playing second fiddle to various other things. I started writing a novel in, I think, September '11 and finished it about 3 weeks ago. So now I am sat around, wondering if I should get a sensible paying job or whether someone might buy the damn thing. It's been a privilege and a pleasure to have that time to write but very stressful being really poor over the course of a year. So I could do with a bit of New Year, New Phase kicking in. With this is mind, I am going to have myself a little Diwali by lighting some candles and er, eating coconut barfi. I have already celebrated Diwali by making the unhappy woman on the sweet counter explain to me the technical difference between Gulab Jamun and Kala Jamun, for which I will probably recieve a certain amount of bad karma in due course. Anyway. 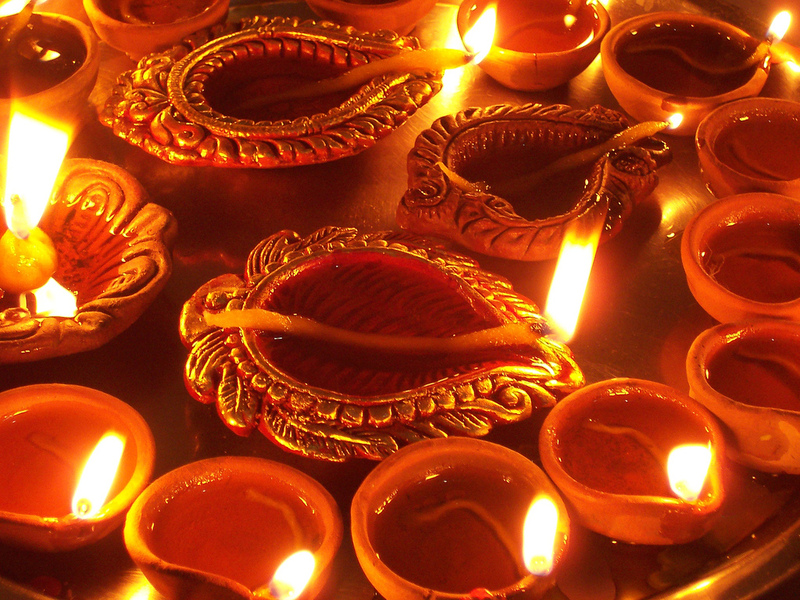 Diwali, amongst other things is the Festival of Light. One of the things I like about Hinduism (there are other things I don't) is that unlike the Abrahamic religions which equate darkness with evil and light with good, Hinduism equates darkness with ignorance, and light with knowledge. Which seems to me a much saner way of looking at things. I generally think Diwali is a brilliant festival and much nicer than bonfire night. While I am massively in favour of bonfires and fireworks I don't desperately like the idea of an event which celebrates that the Protestants won over the Catholics. I'd be quite happy if we ditched bonfire night in favour of Diwali, and declared it a bank holiday, so that there was a nice long weekend somewhere in the great slog between August and Christmas. I know, that'd mean we'd have to give the Muslims a bank holiday too - fine by me - I'm all in favour of more parties and less drudgery. Anyway, I wish you all a very Happy Diwali*. Please wish me one too. *If you can't stomach religion of any kind, I still recommend barfi. Diwali is one of the auspicious holidays for Hindus and this is something I really look forward to. too all of my friends and family, happy Diwali! The festival of Diwali marks the happy return of lord Rama to Ayodhya after fourteen year’s exile. It is a festival of lights and festivities. Best Diwali image wallpaper 2018.